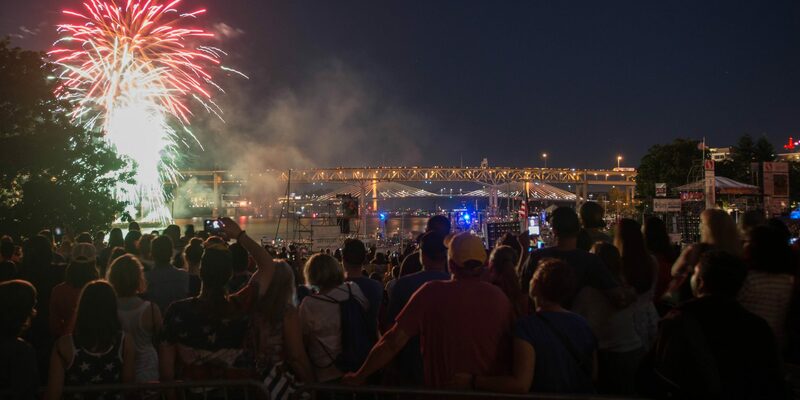 To some boaters in the region, the 4th means one thing—the Waterfront Blues Festival. 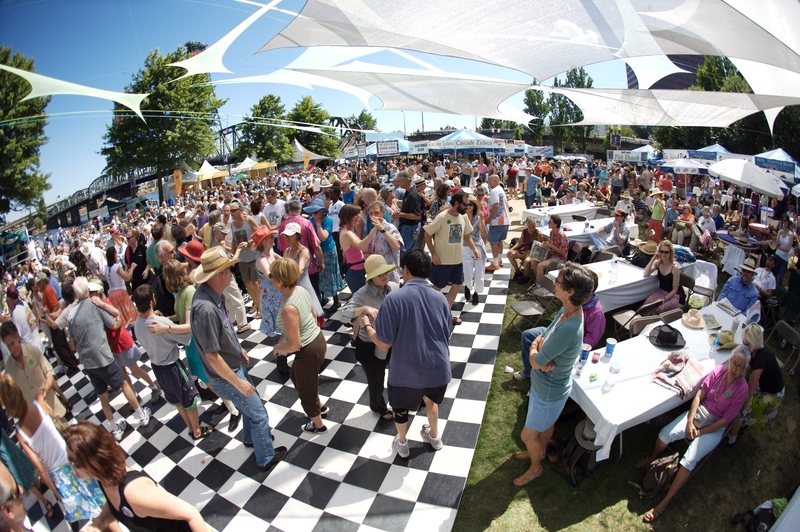 For more than 30 years the Portland Tom McCall Waterfront Park has been host to one of America’s premier blues festivals; some will argue it ranks as one of the world’s best. There are a number of stages that provide an almost constant flow of music from 11:00am until after dark. Performers such as Buddy Guy, Keb Mo, Robert Plant and the Spaceshifters and many more have all graced the stage and given audiences a night to remember. Attending the festival by boat offers a unique experience not available to all festival goers. With the right timing, you can anchor close to shore with a view of the main stage and enjoy music from the deck. Want to be right up front for your favorite artist? Take the dinghy ashore and join the crowd on the lawn. When you’ve had enough, it’s easy to retreat to your boat to take in the next show without the crowd. Tailoring your experience can be done, but it requires a way to get ashore. Outside of festival hours, there are a ton of things to see and do. All of downtown can be accessed by foot from Tom McCall Waterfront Park. Shopping, site-seeing and dining are all close by. Portland has an incredible array of restaurants offering an insanely diverse mix of food from all regions of the world. Some of these restaurants began as food-carts. For a taste of the next big wave in Portland’s culinary scene try one of the food carts clustered in several areas downtown. An interesting spin on donuts can be had at Voo-Doo Donuts; Capt’n Crunch®, Bubble Gum and Bacon are not out of the question. Stroll south from the park along the promenade for the morning coffee or an afternoon (or morning) ice cream. There are also some open-air dining opportunities that will offer a break from the festival and some great people watching. Set up early. Moorage is on a first come, first served basis. Some of the prime spots have been taken as early as Father’s Day. Don’t worry, there will still be space closer to the day of the event, but plan on at least a week ahead of time. The city sets up a temporary floating dock and has in the past offered porta-potties. Top off your tanks: As the anchorage fills in, it will be impossible to move your boat. Make sure that the freshwater and fuel tanks are full and that the holding tank is empty. Manage your power usage: Run the generator as needed, but be courteous to those around you. The living quarters are pretty tight. Bring a dinghy: getting ashore will really enhance the experience. 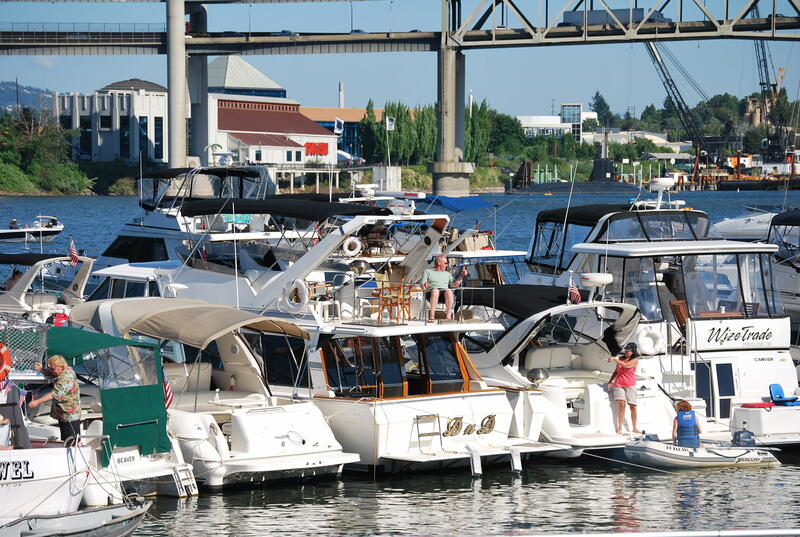 A dinghy is critical to enjoying downtown Portland or getting the front-row view of your favorite artist. Swimming is not widely encouraged—you never know which way your neighbor’s Y valve is turned. Safeway grocery store: for re-supplying. 1010 SW Jefferson St.
Crowd-factor: Waterfront Blue Fest (around July 4th) is by far the busiest time.